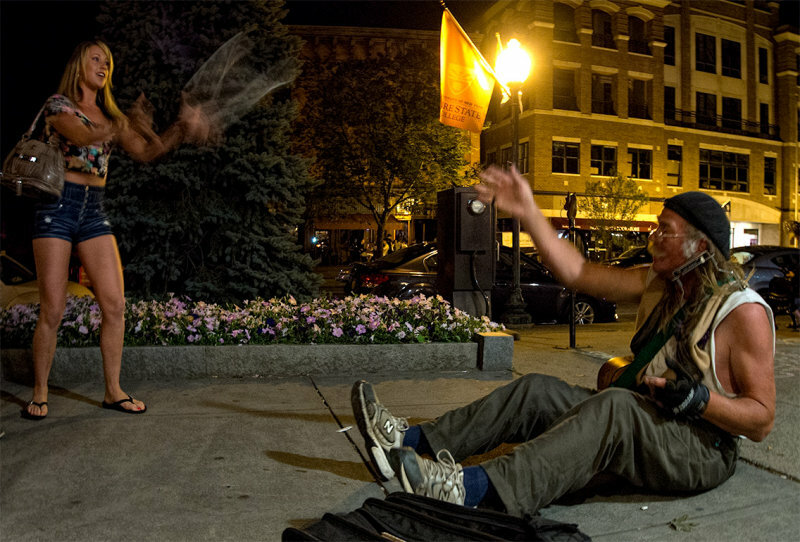 The busker on the sidewalk is Tom and plays the guitar along with a tambourine around his foot and sometimes a harmonica in his mouth. In this image he has just taken the tambourine off and tossed it to the girl who offered to shake the tambourine while he sang a song. As he started he broke a string on his guitar which ended the session. A wonderful night capture, Frank! V.
Great photo Frank. Your timing, shutter speed and choice of vantage point were perfect. "V"
Great shot of the action and people! V.
Excellent candid Frank. The slow shutter adds to the ambiance.